The Minooka #SmithStrong Invite was intended to drop some fire, but wind and injuries said otherwise. With winds spiking up and temperatures early in the meet being in the low 40's to start. 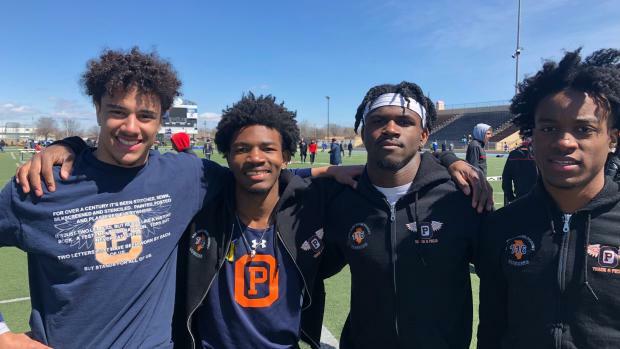 An early season matchup in the 110H between Oak Park-River Forest's JT Lowder, and Koren Leonard, and Neuqua Valley's Donovan Turner never truly materialized as all three standouts nursed hamstring injuries and issues. Winds destroyed the returning all-stater as he only ran 15.53, a week after running 14.43. Lowder ended up tweaking his hamstring causing him to sit out the 300H. Leaving the door wide open for Aidan McBride of Lyons Township to come home with a huge win. In the distance events, Batavia emerged once again in the 4x800m relay with an 8:04.10 holding off a very shocking Lakes Community team that ran 8:06.70. Ian Geisler of Huntley went out very strong in the 3200m, actually going 9:00 pace for the first few laps. He eventually fell off that pace, but still ran a very good 9:28.73. Jared Kreis of Lincoln-Way Central sat out the 3200m at this meet setting himself up to run a great 1600m which he did taking out a stacked field with a 4:22.47. In the sprints, Tyrone Clarke of Oak Park-River Forest won a battle with wind and the 100m with an 11.29 while his teammate Amir Blanchard won the 200m in 22.54. The Huskies continued to do well in the sprint relays with wins in the 4x100m and 4x200m, clocking 43.15 and 1:30.41 respectively. Moving to the field, Keon Gilbert of Oak Park-River Forest won shot put with a 54-4 while teammate, Mykolas Saloninas, threw a 48-2.50 to take 5th place. After having three straight scratches, Myles Lincoln of Plainfield South popped off a 45-4 in the triple jump while summer teammate, Kwesi Yeboah of Oak Park-River Forest, dealt with some injury issues.